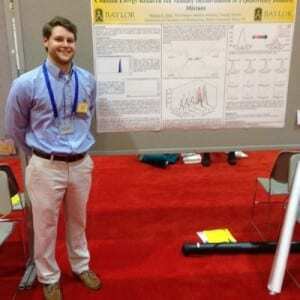 Michael E. Pettit is a 4th year PhD candidate at Baylor University. He graduated from James Madison University in May 2013 with Bachelor of Science degree in Chemistry (ACS certified). While at JMU, he received the American Chemical Society’s Undergraduate Student Award in Environmental Chemistry for investigating the chemical and physical attributes of water in Lake Keokee, Virginia and the use of liming to improve water quality in Lake Keokee. At BU, Michael serves as President of the Chemistry Graduate Student Association and Primary Representative to the Graduate Student Association. 1- Collision-energy resolved ion mobility characterization of isomeric mixtures: Limited ion mobility (IM) resolving power of IM-MS instruments may prevent isomer differentiation and result in erroneous analyte characterization. We showed that overlapped IM profiles can be deconvoluted using post-IM/collision-induced dissociation (CID) MS combined with SIMPLe-to-use Interactive Self-modeling Mixture Analysis (SIMPLISMA) technique. Here, we utilize Automated Ion Mobility Deconvolution (AIMD) software for collision-energy resolved IM deconvolution of overlapped isomeric three- and four-component mixtures. 2- Automated peak width measurements for targeted analysis of ion mobility unresolved species: Peak broadening in ion mobility (IM) is a relatively predictable process and abnormally broad peaks can be indicative of the presence of unresolved species. Here, we introduce a new ion mobility peak fitting (IM_FIT) software package for automated and systematic determination of traveling wave ion mobility (TWIM) unresolved species. To identify IM unresolved species, the IM_FIT software generates a trend line by plotting ions’ mobility peak widths as a function of their arrival times. Utilizing user-defined thresholds, IM_FIT allows for automated and rapid detection of ions that deviate from the peak width trend line. 3- Broadband ion mobility deconvolution for high-throughput analysis of complex mixtures: We have previously shown that pure IM-MS data could be extracted from IM unresolved post-IM/collision-induced dissociation (CID) MS data using Automated Ion Mobility Deconvolution (AIMD) software [J. Am. Soc. Mass Spectrom., 2014, 25, 1810-1819]. In our previous reports, we utilized a quadrupole ion filter for m/z-isolation of IM unresolved monoisotopic species prior to post-IM/CID MS. Here, we use a broadband IM-MS deconvolution strategy to remove the m/z-isolation requirement for successful deconvolution of IM unresolved peaks. Elimination of the ion isolation step expands the applicability of AIMD to high-throughput analyses by reducing experimental time requirements. 4- Data independent high resolution UPLC-MS/MS imaging for enhanced proteome coverage of laser ablated regions of interest from a rat brain tissue: Brain tissue extracts were collected from 2 x 2 mm regions of rat brain tissue sections via laser ablation sample transfer (LAST), and enhanced proteome coverage of each region was achieved using complementary data-dependent acquisition (DDA) and ion mobility enhanced data-independent acquisition (often referred to as HDMSE) acquisition strategies. This work demonstrates that results from mass spectrometry imaging (MSI) of spatially localized tissue extracts collected via LAST are enhanced by the complementary use of DDA and HDMSE as multidimensional mass spectrometry techniques for high-throughput bottom-up proteomics. 2. Pettit, M., Harper, B., Brantley, M., Solouki, T., “Collision-energy Resolved Ion Mobility Characterization of Isomeric Mixtures.” Analyst 2015, 140, 6886-6896. 3. Pettit, M. E., Brantley, M. R., Solouki, T., “Broadband Ion Mobility Deconvolution for High-throughput Analysis of Complex Mixtures.” Analyst 2016, under review (as of November 2016). 4. Pettit, M.E., Donnarumma, F., Murray, K. K., Solouki, T. “Data Independent High Resolution UPLC-MS/MS Imaging for Enhanced Proteome Coverage of Laser Ablated Regions of Interest from a Rat Brain Tissue.” (under internal review, October 2016). 1. Pettit, M. E., Brantley, M. R., Solouki, T., “Rapid Ion Mobility Deconvolution for High-throughput Analysis of Structural Isomers” Proceedings of the 64thASMS Conference on Mass Spectrometry and Allied Topics, 2016, San Antonio, TX. 2. Brantley, M. R., Pettit, M. E., Harper, B., Brown, B., Solouki, T., “Peak Width Analysis for Automated Detection of Unresolved Isomers in Ion Mobility” Proceedings of the 64thASMS Conference on Mass Spectrometry and Allied Topics, 2016, San Antonio, TX. 3. Donnarumma, F., Pettit, M. E., Solouki, T., Murray, K. K., “Liquid Chromatography High Resolution Tandem Mass Spectrometry Of Laser Ablation Sampled Tissue” Proceedings of the 64th ASMS Conference on Mass Spectrometry and Allied Topics, 2016, San Antonio, TX. 4. Pettit, M. E.; Harper, B.; Brantley, M. R.; Solouki, T. “Collision-Energy Resolved Ion Mobility Deconvolution of a Ternary Isomeric Mixture” The Pittsburgh Conference on Analytical Chemistry and Applied Spectroscopy, 2015, New Orleans, LA. 5. Harper, B.; Brantley, M.; Pettit, M.; Solouki, T. “Automated Collision Cross Section Calculation for Traveling Wave Ion Mobility Spectrometry Instruments” Proceedings of the 62nd ASMS Conference on Mass Spectrometry and Allied Topics, 2014, Baltimore, MD. 6. Harper, B.; Zekavat, B.; Brantley, M.; Pettit, M.; Solouki, T.“Energy Resolved Ion Mobility Deconvolution of Isobaric Compounds” Proceedings of the 62nd ASMS Conference on Mass Spectrometry and Allied Topics, 2014, Baltimore, MD. 7. Zekavat, B.; Harper, B.; Brantley, M. R.; Pettit, M. E.; Solouki, T. “Use Of Multivariate Curve Resolution And Ion Mobility-Mass Spectrometry For Isomer Differentiation” Proceedings of the 62ndASMS Conference on Mass Spectrometry and Allied Topics, 2014, Baltimore, MD.